1848: Invention of the "guttie," the gutta-percha ball. 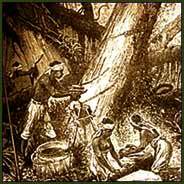 Gutta Percha is an inelastic natural latex produced from the sap of tropical trees native from Malaya. It was found to be malleable when boiled in water, and was easily pressed into the shape of a ball. When cooled it became hard and non-brittle. The Gutta Percha ball contributed greatly to the expansion of the game. 1851: The Prestwick Golf Club is founded. 1856: Pau Golf Club is founded in France, the first in Continental Europe. The Royal Curragh Golf Club is founded at Kildare, the first golf club in Ireland. A rule change is enacted that, in match play, the ball must be played as it lies or the hole be conceded. It is the last recorded toughening of the rules structure. 1857: The first book on golf instruction "The Golfer's Manual", by "A Keen Hand" (H.B. Farnie), is published. The Prestwick Club institutes the first Championship Meeting, a foursomes competition at St. Andrews attended by eleven golf clubs. George Glennie and J.C. Stewart win for Blackheath. 1858: The format of the Championship Meeting is changed to individual match play and is won by Robert Chambers of Bruntsfield. Allan Robertson becomes the first golfer to break 80 at the Old Course, recording a 79. 1859: The first Amateur Championship is won by George Condie of Perth. Death of Allan Robertson, the first great professional golfer. 1860: The Prestwick Club institutes a Professional Championship played at Prestwick; the first Championship Belt is won by Willie Park. 1861: The Professionals Championship is opened to amateurs, and the British Open is born. The first competition is won by Old Tom Morris. 1867: The Ladies' Golf Club at St. Andrews is founded, the first golf club for women. Written by one of the greatest players ever. 1869: Young Tom Morris, age 17, wins the first of four successive British Open championships. His streak would include an 11-stroke victory in 1869 and a 12-stroke victory in 1870 (in a 36-hole format). His 149 in the 1870 British Open over 36 holes is a stroke average that would not be equalled until the invention of the rubber-cored ball. 1870: Young Tom Morris wins his third consecutive British Open Championship, thus winning permanent possession of the Belt. The Royal Adelaide Golf Club is founded, the first golf club in Australia. 1872: The British Open Championship is reinstituted when Prestwick, St. Andrews and the Honourable Company offer a new trophy, with the Open Championship to be hosted in rotation by the three clubs. Young Tom Morris wins his fourth consecutive British Open Championship. 1873: The Royal Montreal Golf Club is formed, the first club in Canada. The British Open is held for the first time at the Old Course. 1875: The Oxford and Cambridge University Golf Clubs are founded. 1878: The first University Match is played at Wimbledon, won by Oxford. 1880: The use of moulds is instituted to dimple the gutta-percha ball. Golfers had long noticed that the guttie worked in the air much better after it had been hit several times and scuffed up. 1883: Bob Ferguson of Musselburgh, losing the British Open in extra holes, comes one victory shy of equalling Young Tom Morris' record of four consecutive titles. Ferguson ends up later in life penniless, working out of the Musselburgh caddy-shack. 1884: The Oakhurst Golf Club is founded at White Sulphur Springs. The first hole at The Homestead survives from this course and is the oldest surviving golf hole in America. 1885: The Royal Cape Golf Club is founded at Wynberg, South Africa, the first club in Africa. 1886: A.J. Balfour is appointed Chief Secretary (Cabinet Minister) for Ireland; his rise to political and social prominence has an incalculable effect on the popularity of golf, as he is an indefatigable player and catalyzes great interest in the game through his writing and public speaking. 1887: "The Art of Golf" by Sir Walter Simpson is published. 1888: The St. Andrews Golf Club is founded in Yonkers, New York, the oldest surviving golf club in America. The Royal Antwerp Club is founded in Belgium. 1890: John Ball, an English amateur, becomes the first non-Scotsman and first amateur to win the British Open. Bogey is invented by Hugh Rotherham, as the score of the hypothetical golfer playing perfect golf at every hole. Rotherham calls this a "Ground Score," but Dr. Thomas Brown, honorary Secretary of the Great Yarmouth Club, christens this hypothetical man a "Bogey Man," after a popular song of the day, and christens his score a "Bogey." With the invention of the rubber-cored ball golfers are able to reach the greens in fewer strokes, and so bogey has come to represent one over the par score for the hole. 1892: Gate money is charged for the first time, at a match between Douglas Rollard and Jack White at Cambridge. The practice of paying for matches through private betting, rather than gate receipts and sponsorships, survives well into the 20th Century as a "Calcutta," but increasingly gate receipts are the source of legitimate prize-purses. The Amateur Golf Championship of India and the East is instituted, the first international championship event. 1893: The [British] Ladies' Golf Union is founded and the first Open Championship won by Lady Margaret Scott, at St. Anne's. 1894: The Open is played on an English course for the first time and is won for the first time by an Englishman, J.H. Taylor. The United States Golf Association is founded as the Amateur Golf Association of the United States. Charter members are the Chicago Golf Club, The Country Club, Newport Golf Club, St. Andrews Golf Club, and Shinnecock Hills Golf Club. Tacoma Golf Club is founded, the first golf club on the Pacific Coast.